riskyr is a toolbox for rendering risk literacy more transparent. 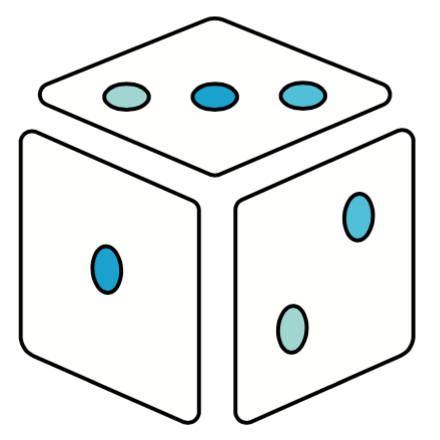 Its goal is to gain insights into risk-related scenarios with a minimum of hassle and maximum of fun. Define your own scenario from risk-related information (typically provided in terms of probabilities). Inspect one of 24 predefined scenarios to get a glimpse of what types of scenarios are possible. 45% of 753 jailed offenders in some prison re-offend after they are released (prev = .45). Your test correctly detects those who will re-offend in 98% of the cases (sens = .98). Your test falsely identifies 54% of those who will not re-offend as potential re-offenders. Conversely, this implies that your test correctly identifies 46% of those that will not reoffend (spec = .46). John D. is about to get released and is tested. The test predicts that he will reoffend. What is the probability that John D. will actually reoffend, given his test result? To answer this question, you could calculate the corresponding probabilities or frequencies (as explained in the user guide). Alternatively, you can use the riskyr() function to create a riskyr scenario that you can modify, inspect, and visualize in various ways. The probability of reoffending provides the prevalence in our population: prev = .45. The test’s conditional probability of correctly detecting a reoffender provides its sensitivity: sens = .98. The test’s conditional probability of correctly detecting someone who will not reoffend provides its specificity: spec = .46. This creates my_scenario from 3 essential probabilities (prev, sens, and spec or fart) and computes a suitable population size N of 1000.
scen_lbl specifies a label by which you can recognize the scenario (e.g., “Identifying reoffenders”). popu_lbl specifies the population of interest (e.g., “inmates”). cond_lbl specifies the condition of interest (i.e., “reoffending”). cond_true_lbl specifies a label for the condition being true (“offends again”). cond_false_lbl specifies a label for the condition being false (“does not offend again”). dec_lbl specifies the nature of the decision, prediction, or test (“test result”). dec_pos_lbl specifies a positive decision regarding the condition (“predict to reoffend”). dec_neg_lbl specifies a negative decision regarding the condition (“predict to not reoffend”). correct rejection: The test predicts that the inmate does not reoffend and s/he does not (“correct release”). The simple graph has brought more information to the data analyst’s mind than any other device. (…) the meat of the matter can usually be set out in a graph. We always can inspect the details of my_scenario by computing additional metrics and studying their values with summary(my_scenario). But anyone who regularly works with data knows that graphs can provide key insights faster and in different ways than written summaries and tables. To illustrate this point, we create and inspect some visualizations of our scenario. The resulting graph maps frequency to the size of square boxes, which makes it easier to distinguish between cases with high and with low frequencies. Plot my_scenario with the option area = "hr". What do you see? Add by = "cdac" as another argument to your plotting call. How does the resulting plot relate to the previous ones? When calling plot(my_scenario), riskyr creates a plot of type = "prism" by default. Use ?plot_prism for the documentation of plot_prism to learn about and try out additional arguments. From the icon array, we can easily see that roughly half of the inmates reoffend (see the icons in dark green and dark blue). The majority of the reoffenders are classified correctly (shown in dark green rather than dark blue). But where is John D.? His test result predicted that he would reoffend. Depending on his actual behavior, this means that he will either be classified as a “reoffender found” (if he actually reoffends: dark green icons) or as a “false accusation” (if he does not reoffend: light red icons). 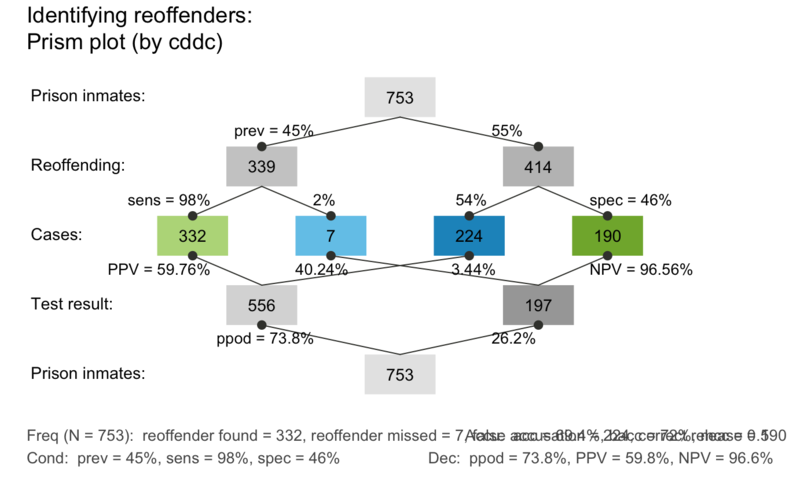 As there are a similar number of both types of icons (with some skew towards “reoffenders found”), it appears that his chances of actually reoffending are only slightly higher than chance. The text output (printed in R’s console window) provides a brief description of our scenario (i.e., its name, the condition and decision of interest, as well as the type and size of population), followed by a range of numeric parameters (structured into probabilities, frequencies, and overall accuracy). In the present case, we were interested in a person’s conditional probability of reoffending given a positive test result. This metric is also known as the positive predictive value (PPV). Our summary information shows PPV = 0.598. 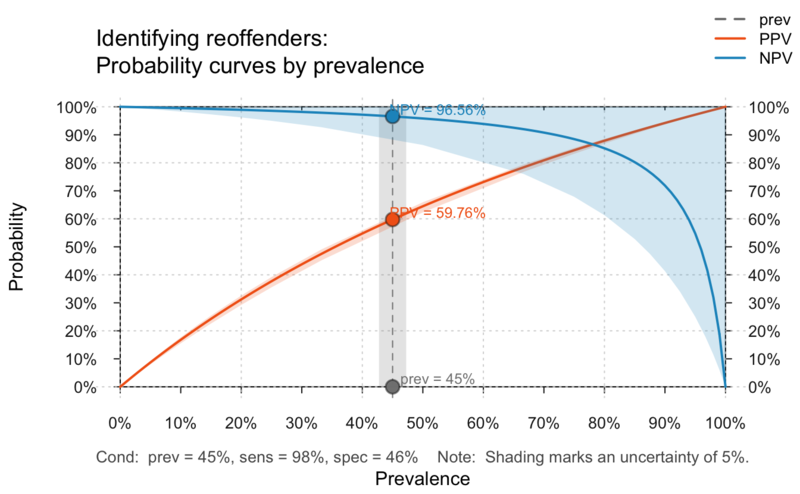 Thus, based on the information provided, John D.’s probability of reoffending is 59.8% (quite in line with our visual estimate from the icon array above). 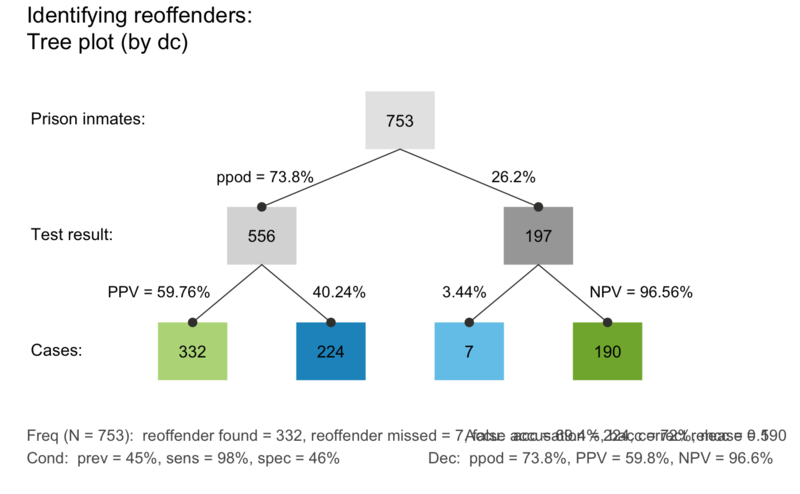 The frequency tree also shows us how the PPV (shown on the arrow on the lower left) can be computed from frequencies (shown in the boxes): PPV = (number of offenders found)/(number of people predicted to reoffend) (or PPV = hi/dec_pos). Numerically, we see that PPV = 332/556, which amounts to about 60% (or 1 - 0.403). Having illustrated how we can create a scenario from scratch and begin to inspect it in a few ways, we can now turn towards loading scenarios that are contained in the riskyr package. In the following, we show you can select and explore these scenarios. s10 <- scenarios$n10  # assign pre-defined Scenario 10 to s10. #>  "Male patients with symptoms"
#>  "Arkes, H. R., & Gaissmaier, W. (2012). Psychological research and the prostate-cancer screening controversy. Psychological Science, 23(6), 547--553." With a cutoff point of 4 ng/ml, the PSA test is reported to have a sensitivity of approximately 21% and a specificity of approximately 94% (Thompson et al., 2005). That means the PSA test will correctly classify 21% of the men with prostate cancer and 94% of the men who do not have prostate cancer. Conversely, the test will miss about 79% of the men who actually have prostate cancer, and raise a false alarm in 6% of the men who actually do not have prostate cancer. Suppose that this test is given to 1,000 patients at a urology clinic who have symptoms diagnostic of prostate cancer. Perhaps 50% of these men truly have prostate cancer. Table 1 depicts this situation. Of the 135 men who test positive, 105 actually have prostate cancer. Thus, the positive predictive value of the PSA test in this situation is approximately 78% (i.e., 105/135 _ 100). Note that – in this particular population – the prevalence for the condition (Prostate cancer) is assumed to be relatively high (with a value of 50%). 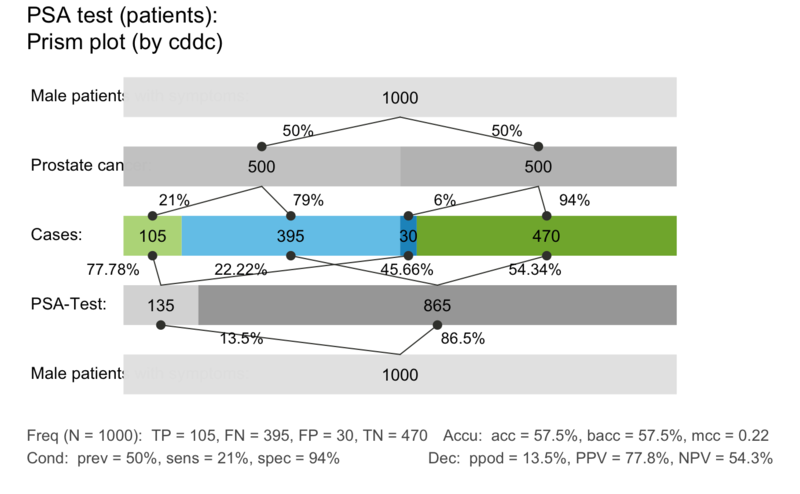 These initial inspections reveal that the overall accuracy of the decision considered (PSA test (patients)) is not great: There are almost as many cases of incorrect classifications (shown in blue) as correct ones (shown in green). In fact, both the summary and the icon array note that the overall accuracy of the test is at 57.5%. Given that green squares signal correct classifications and blue squares signal incorrect classifications, it is immediately obvious that our main issue with accuracy here consists in so-called misses: Patients with cancer that remain undetected (marked with “FN” and denoted by icons in lighter blue). 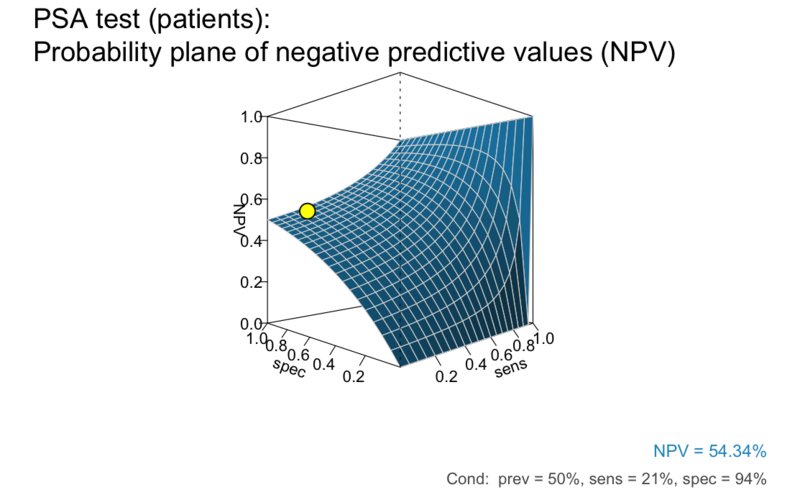 This variant of the prism plot shows how the probability values of key condition and decision parameters split the assumed population of N = 1000 patients into subgroups that correspond to 9 frequencies (also listed in the summary). Calling the same command with the optional argument p_lbl = "nam" would print the probability names, rather than their values (see also the options p_lbl = "min" and "mix".) The middle row of boxes shows the four essential frequencies (of hits hi, misses mi, false alarms fa, and correct rejections cr) in colors corresponding to the icon array above. Setting area = "hr" in our plot command switched the default display (of rectangular boxes) to a version in which the frequency boxes at each level of the network are shown as horizontal rectangles (hence hr) and the box widths are scaled to add up to the population width N on each level. Thus, the relative width of each box illustrates the frequency of corresponding cases, making it easy to spot locations and paths with few or many cases. A fact that was not so obvious in the icon array – but shown in the lower half of the prism plot – is that the current scenario yields mostly negative decisions (865 out of 1000, or 86.5%). Of those negative decisions, 470 (or 54.34%) are correct (see cr shown in light green) and 395 (or 45.66%) are incorrect (see mi shown in dark red). The ratio cr/dec_neg = 470/865 = 54.34% indicates the negative predictive value (NPV) of the test. The additional argument what = "all" instructed riskyr to provide us with additional curves, corresponding to the percentage of positive decisions (ppod) and overall accuracy (acc). Just like PPV and NPV, the values of these metrics crucially depend on the value of the current prevalence (shown on the x-axis) and on our current range of uncertainty (shown as shaded polygons around the curves). Interestingly, the curves of ppod and acc appear to be linear, even though the riskyr function plots them in exactly the same way as PPV and NPV. Would you have predicted this without seeing it? Explain why the line of acc intersects the curve of PPV at the point at the same point as the curve of NPV. This comparison shows that the curves of PPV and NPV (created by type = "curve" above) were only two out of an infinite number of possible intersections of two planes (created by type = "plane" here). 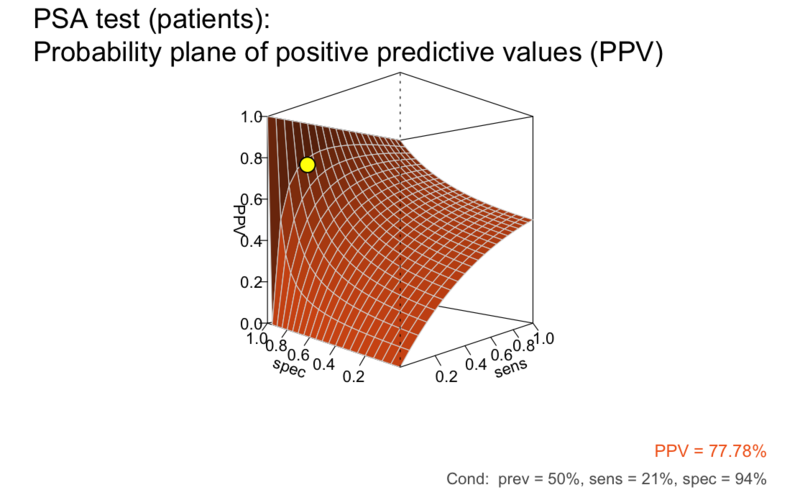 Consequently, the current values of PPV and NPV (shown as yellow points on the planes) crucially depend on the condition’s prevalence (prev), the decision’s sensitivity (sens), and the decision’s specificity (spec). In retrospect, these dependencies make it clear why it is so hard to provide an answer to the seemingly simple question: What’s the probability of having some condition when testing positive or negative for it? While riskyr cannot simplify this issue, we hope that you are convinced that it helps to compute, transform, and see some relationships that are not immediately obvious from the mathematical definitions of the underlying concepts. If you feel that this improves your understanding, we came a little closer to our goal of rendering risk literacy more transparent. Scenario 9 in the riskyr collection of scenarios contains a version of the same situation that assumes a different population (with a lower prevalence value for the same condition). Inspect and explore the consequence of this change by following the same steps for s9 as for s10 above. s9 <- scenarios$n9  # assign pre-defined Scenario 9 to s9. Now re-do the plots (for s10 above) – and note the changes between s9 and s10. Importantly, the properties of the test are identical for both scenarios – only the population (i.e., its prevalence for the condition) has changed. This introduction should suffice to get you started with using riskyr. Have fun by exploring the provided scenarios and creating your own examples! Dressel, J., & Farid, H. (2018). The accuracy, fairness, and limits of predicting recidivism. Science Advances, 4, eaao5580.